Clever Container has several products that would be very useful to other Home Run Businesses or Direct Sales Businesses or even people who travel a lot. The purpose of this blog is to point out which products are the best fit and why. After holding several shows in other peoples' homes and lugging all of my business supplies around with me with multiple trips to the car, I decided it would be a great idea to get my own business organized. If you do hold shows in other peoples' homes and do have a lot of inventory or supplies, it can look like you don't have it all together if you have a hard time bringing in and setting up for the show. If you appear to have it all together with your business, it will help entice people to perhaps want to work in the same business. At times, guests may not feel the business appeals to them when they see how much they need to keep up with and lug around. But, by being organized- you make it look fun and much easier. Here are a few products from Clever Container that can help with other types of businesses. They are listed by product and how they can be used in different business types. This very popular item offered in Pink, Red, and Jet is currently held up in production. interior pockets for keys, phone, and accessories. Perfect for anyone who works on the go. Alphabetized mini-card file. Holds approximately 80 cards. Comes in black or pink. 5x3. BUSINESS USES: You always meet other people who can be considered leads or potential customers when you are out and about or at Vendor or training events. Keep their contact information in this convenient carrier. Don't miss out on future business opportunities. This bag is huge, but still lightweight. It comes in Pink (shown) or Blue. It is water-resistant. Holds its shape and stands with a flat bottom. And, has a zipper across the top. This bag is unique with two different strap lengths for an over the shoulder option. It is a deep bag with 6 deep pockets so it can be used for larger items. It has a durable bottom and can stand on its own with a leatherette reinforced bottom. Water Resistant with a secure zipper top. keep your device with you at Vendor Events and Home Shows. It also allows full functionality of the device through the cover. This will eliminate the chance that something will spill on your device. These boxes are sturdy, come in a plastic material that is waterproof. They are also stackable which keeps space at a premium. -TAX SEASON: Are you scrambling to get all of your receipts and business expenses together? Keep your business tax papers organized all year with these convenient boxes. There are 5 so you can keep 5 years worth of business items in each. This item attaches to your car seat and can swing out of the way when not needed. smaller pockets for your office on the go. Comes in Black and Green Butterfly (shown). Waterproof, nylon bucket that is fully collapsible into its own zippered carrying case. Comes in Yellow (shown), Lime and Sky. 2.9 gallons. -ADVERTISEMENT OPPORTUNITY: The top of this Clever Bucket can be monogrammed with your business name, contact information and logo. Carry this bucket with you to tennis, the pool, on your boat or the beach as a walking advertisement for your business. Also useful if you knit your own scarves is the Flip Flop File for storing yarn or completed scarves. If you make Jewelry using small parts or beads, this is the Clever Container item for you!!! This is typically used for traveling and you can keep up to two weeks worth of vitamins or medications. The red and blue colors denote morning and night. 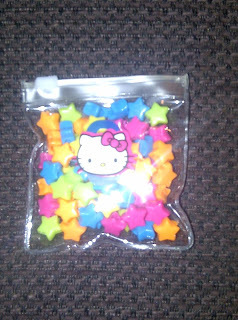 But, these zippered, see through pouches can easily be used to hold beads, clasps, or any other items you might need at a Vendor Fair or Craft Fair for making your jewelry while you are there. Small and compact, it would slip easily into your purse for easy carrying. In this picture, you can see one of the pouches holding beads. The number has been covered with a cute Hello Kitty Sticker. You could leave the number or cover it with your choice of stickers. There are a few guidelines to follow once you make up your mind to get organized. If you follow these guidelines, you will become organized and be able to stay that way. Purging is the first step in getting organized. The less you have to organize, the more organized you can be. If it has sentimental value- keep it, but don't hide it away in a cabinet. Put it out on display and use it. I have several pieces I use daily. For example, a set of wooden bowls from my grandmother. I use the largest to hold magazine in our living room and I use one of the smaller ones to hold bread. The same goes for children's artwork. If you want to save it, put it in pretty frames or invest in a created memory book where your children's art can be saved permanently without the boxes of paper. Such sites as http://www.blurb.com/ will create a book for your child's art. In your closet, turn the hangers backwards for a season. As you wear the item, turn the hanger. Get rid of items you didn't wear. Every item should have a specific home. If it does, there will be a place to put it back after you use it. 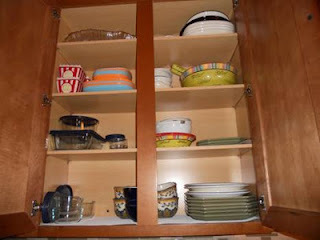 It will also help alleviate the problem of not being able to find items- that is if you always put it back in its home. Get your whole family involved in this process. Labeling items comes in handy with this first step. The place you choose to put an item (much like in the kitchen) depends on how often you will use the item and where you will use that item. You really wouldn't want your seasonal dishes taking up space on the lower shelf of your cabinet when you only use them once in a while. This tip helps in locating items quickly. Items should be categorized by type. For example, all baking supplies together. When items are grouped, store them in containers to fit. You wouldn't store Legos in a toy box, but would store them in a container alone with a lid. Store items that are alike in the same place. Set boundaries. If your daughter collects dolls or doll clothes, give her a specific container just for these items and make a rule that she cannot get more unless she purges some first. Even children need limits. There should be a list om your refrigerator or message board where your kids and anyone else in your home can write items if they use the last of it. This goes for groceries as well as toothpaste, etc. This will save you time when you go to make your shopping lists. You need to be firm with this list. the first time your husband asks you if you bought some more shaving cream, you will have to say, "Did you put it on the list?" This goes for older children as well. They will soon begin to use the system you put in place. In this category of making list, I will say that having a Home Binder works great. I will be posting more on this in April, but a home binder is a place for you to keep everything in order so the home will run smoothly. Additional copies of menu planners/grocery list, calendars, school papers and schedules, babysitter notes, weekly cleaning schedules and home maintenance checklists, pet information, important phone numbers. Whatever you need to have at arm's length goes into this binder. Even if you never get around to having a home binder (you can read more in April and hopefully get one going that works for you), you should have a calendar in full sight for everyone in the house to use. This will allow everyone to know what is going on during the week. A Home Binder and a Calendar are example of a system. Using a label maker to organize items for your home is an example of a system. If everything has a place, everyone needs to put things back in those places. If everyone uses the systems, the home will stay organized. For kids' toys, place toys within easy reach of the kids so they can help clean up when it is time. Only put out a certain amount of toys at one time and store the rest away. Rotate these toys sporadically- kids will think they have new toys and it will alleviate boredom and a mess. Kids will play more if they have less to play with. They will also create less of a mess at any given time. This tip just means that you store items where they will be needed most. 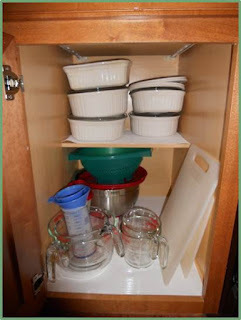 You don't want to store your baking items in your biggest kitchen cabinet if you never bake. You also don't want to store all of your kid's sporting items in the only coat closet you have in your entryway. This holds especially true in the kitchen. You need your counter space for food preparation and dishes. If you are not using an item all of the time, store it out of site. Only place on the countertop what you will use most. Store seasonal items on a top shelf. You should organize one area completely at a time. 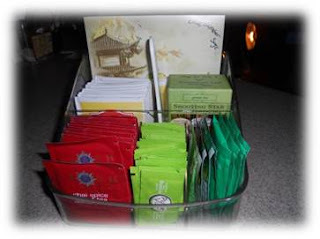 When it is organized, keep it that way by performing daily maintenance. After you eat breakfast, make it a point to put away the cereals, etc. Before you begin cooking dinner, empty the dishwasher of clean dishes and put them away. If the dishwasher is empty before you begin preparing the meal, the used utensils and dishes can be put there as you prepare and plates can be put there after the meal. This saves you time. Also, have set times during the day when you tidy up the clutter. You could have a basket at the end of the staircase where you put items that need to go back upstairs. Take this basket up once and empty it out and put items away. I hope these tips help you to get organized. Put these systems in place and perform routine maintenance. Things will change sometimes depending on life changes, but if you have an overall system in place, you will save time and money in the long run. I ran across this quote this week and fell in love with it. It is very true that we as women can succumb very quickly to the idea that we need to be perfect in every way. We really tend to focus on getting IT ALL DONE to a perfect level which causes us to stress, fret, and overall panic about everything. We stay on high alert. And, having been a career woman for 10 years outside of the home, you can drive yourself crazy trying to even get the bare minimum done. Women today do a lot!!! I must at this point and time interject myself with a commercial break. I do LOVE my husband who has routinely been someone to help with the tasks around the house. Ok-- back to the point at hand. We are BUSY!!!! We plan and cook meals, clean, take care of kids, feed the dogs, run the errands along with grocery shopping and some of us complete the budget and work outside of the home on top of it all. It is no wonder that our houses are unorganized- we just don't have the time to be PERFECT. Now is the time we take a deep breath and realize WE ARE NOT REQUIRED TO BE PERFECT. Things will be okay. But, becoming a little organized goes a looong way in helping with time management, our budget, our diet and our sanity. We won't focus on every room of the home in this post-- it would be so overwhelming. We are going to focus on the kitchen since that is the topic of the month and the topic of my upcoming WORKSHOP-- KITCHEN NIGHTMARES on February 24. This is especially true of the kitchen. If it doesn't have a place, it will end up in the junk drawer, on the table or on the counter. The places things should live in a kitchen really do vary depending on kitchen size, layout and PRIME RETAIL PROPERTY (amount of storage). f. Spices should be stored away from heat, humidity,air and light. Store them inside of a drawer, cabinet or pantry. Common containers or holders for spices include tins, spice carousels or racks. Spices can also be stored using a Lazy Susan with two levels. See through containers are fine as long as they are kept away from constant light. This helps them keep their flavor longer. 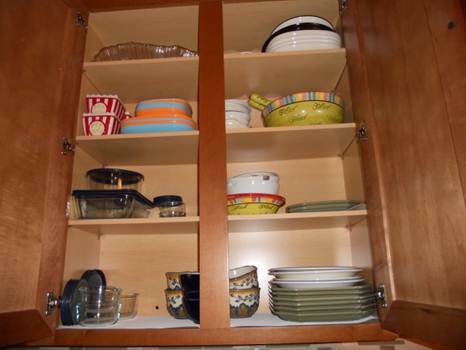 It is easier to unload the dishwasher if plates, bowls and utensils are stored in cabinets nearby. It keeps you from carrying heavy plates across the kitchen. Having a place for everything holds true in the pantry and refrigerator as well. Tip 2: Purge-- if you haven't used it in 3 years and didn't even know you had it- purge. If you have 2 of them- purge. If it's expired (food)- purge. If you don't absolutely love it- purge. You can donate items to Goodwill or others who may need the items. It is okay to throw out expired food- food banks won't accept them (but you can donate ones you have too many of or you don't eat anymore). This is a big one. If you can't find things, you don't know you have them. If it is a cooking tool, you spend too much time looking. If it is food, you re-buy (this can cost extra money). You don't have to have the most beautiful containers money can buy, but you do need to have systems in place that can help keep you organized on a long term basis. I have always done this in my kitchen. Before I begin a meal, the dishwasher has to be empty. As I cook, utensils and other items are placed in the dishwasher. That way, when the meal is finished and the food is put away, I can do something else or just put my feet up. Other family members can rinse their items and place them in the dishwasher as well. It always makes me feel good to come downstairs in the morning to a clean kitchen. It allows me to get my coffee and breakfast with ease and I am not tempted to skip breakfast to clean up the mess from the night before. So, now that you have the tips you can begin. Choose one area per day- refrigerator, cabinets/drawers, or pantry. Empty everything out and begin to sort everything. Have boxes or bags to place items that you will donate or toss. Begin to place items back in the cabinets, etc. in categories that make the most sense. For example: your cookie cutters could be stored with the blender and other baking items. In my own kitchen, I did invest in drawer liner from Bed, Bath and Beyond (you could get it anywhere, but I had a gift card). It is a heavy plastic material with ridges. This helps protect your cabinets and drawers and helps save time when you clean. Here are a few pictures of my kitchen. It is always a work in progress, but it is coming along. I will add more pictures later as one blog- a tour in pictures of my kitchen. Better believe it will be organized before my Kitchen Workshop this weekend. Clever Container Special this month. The Over the Door (OTD) Hang Pantry Organizer. $17 (Regularly $30) when you spend $50. This blog has been a while in coming I know, but little Declan has decided that since he has turned 3 months old that he is going to change his schedule and want mommy a lot. 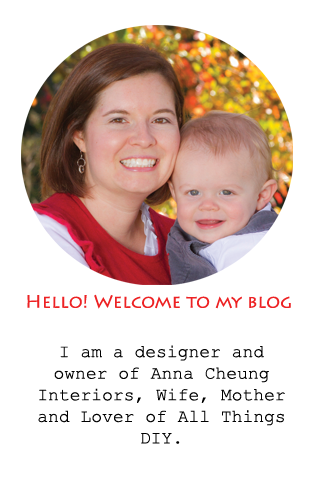 I love every minute of it so I have decided that Declan will take precedence during the day and mommy will get her blog on at night after the Sand Man comes and he is in Lullaby Land. So...after I left you all hanging for #5 on my Top 10 list, here goes-- The FRIDGE CUBE. Tah da!! Clever Container carries a wide variety of fridge containers that can make any refrigerator more organized. The reason I love these is that they come in two different sizes and are large enough to hold a variety of items. Many people love these Cubes to store their children's snacks and drinks in. But, the Fridge Cubes can be used for so much more. Where you use these cubes and how you use them is up to you, but they can be used anywhere especially if you need a container that is waterproof. Refrigerator Use: Using these cubes in the refrigerator is a great idea since they can help alleviate you needing to clean the refrigerator as often. You can eliminate spills and an overall mess to clean up. My 4th favorite item from Clever Container is a new item for the Spring 2013. It is the OTD Pantry Organizer. I, of course, did not use this in my pantry. I already have my pantry organized with shelving connected to the inside of the pantry doors (you can see a picture in my post in the Drawer Organizers). So, I did what any good organizer would do and I thought of another place to hang and use the "Pantry" Organizer -- the inside of our office closet door. I will admit that our office is a real work in progress. When we moved into our home, the office was the one room that my husband sort of took over and made a lot of decisions as to the decor. I must admit that I do love the paint job and the IKEA shelving that we have in the office. But, we have so many books between the two of us and this "office" is used for so many different purposes that it lacks organization that works. In our office, he pays bills and keeps our filing system and works from home at times. In our office, I paint, draw, craft. So, this office holds office supplies, crafting supplies, canvases and paint, our computer, filing system and more. We have a drafting table, two bookshelves, one desk and a filing cabinet along with other containers which hold more crafting supplies. Phew!!! So, I have decided that our one small closet needs an overhaul so that the space in the actual office can "grow". The OTD Pantry Organizer is one of the first steps in this process. I have used it to hold envelopes, packaging supplies, pens and markers, additional packs of staples and paperclips, and supplies for my business like seasonal treat bags, catalogs and order forms. This really did help to get some of the stacked clutter off of one of the bookshelves. The OTD Pantry Organizer has clips at the top and bottom to keep it from sliding around when you open the door. It contains 24 pockets that are made of a mesh material. The pockets are double so you can store items in front of each other. -Bathroom door for bathroom supplies like extra bottles of soap, toothpaste, etc. Toilet paper. Linens. -In a craft room for crafting supplies like glue, tape, stapler, hole puncher, etc. -Laundry room door for spray bottles, cleaners, dryer sheets, etc. -For TEACHERS, this is a great item to have in your classroom. You can hang it on the inside of a closet door to hold all of those additional supplies that are needed in a classroom- notecards, glue sticks, stickers, scissors, packs of markers, crayons, and pencils, class prizes-- the uses are endless. It is all about thinking outside the box!!! !